Last week, we had a rough time with quite a few of our family members trying to fight a dose of what doctors could only call "Food Poisoning"; with 3 out of 7 of us falling sick with severe stomach aches, diarrhea, nausea and vomiting, it was hard to single out the food that could have caused this. One of our cousins even had to be hospitalized while the other 2 rattled on with the pain and medication at home. Unfortunately, cases like these have been significantly on the rise all over US in the past few months, so it becomes imperative to monitor what you eat, even if you cook your own meals at home, as we did, and take extreme caution and care in making sure you follow a few simple guidelines to keep those virus and bacteria at bay! Food Poisoning is a very common problem that people are facing these days, and though most mild cases can be cured naturally within 2-3 days, this is not something that can be ignored. In fact, not taking proper care can lead to really dangerous consequences or complications. More than 250 different diseases can cause food poisoning, and a recent News feature showed that 1 out of every 3 people in the US are becoming victims to Salmonella poisoning. Here's a great writeup and explanation about the different types of virus & Bacteria that cause Food Posioning, and here's a specific one about Salmonella Poisoning. Listed above are just a few symptoms that hint that you might be suffering from food poisoning. Ask your friends or family who's eaten similar meals like you in the past few days if they are having similar symptoms; if not, it could be something else altogether. Sometimes feeling sick from food poisoning shows up within hours of eating the bad food. At other times, it may take upto several days to kick in. With mild cases of food poisoning, you will not feel sick for very long and will soon be feeling fine again. If you throw up, your body has most likely eliminated the "bad food", but if the above symptoms do not wear off in a couple days, consult your doctor immediately. Its better to be safe than sorry. And keep yourself hydrated by drinking loads of water, juices, preferably lemonade, and avoid heavy, starchy or acidic food. 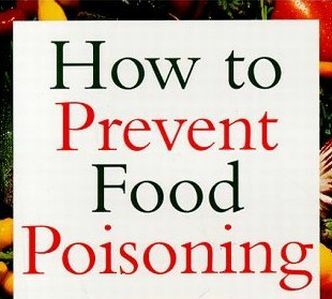 Here are some tips one can follow to prevent Food Poisoning, or at least mitigate its effects. 1. Wash fruits and vegetables thoroughly before eating or cooking with them. Steamed, Baked or cooked food is always better in terms of preventing spread of bacteria than raw food, especially for some vegetables. 2. When shopping for perishable foods, avoid packaging that is torn, or looks really old. Wilted leafy greens and fruits with saggy skin, or browned bananas have probably been lying there for a long time, and its good to pass on them. 3. Look at your food to see any visual signs of staleness, and smell it too. If something looks or smells different from normal, check with another person before eating or drinking it. When in doubt, its better to throw it away than get infected! 3. Leftovers should be preserved carefully in air-tight containers or wrapped in bags, and should be stored in refrigerators. Also, its always a good idea to re-heat your food, especially leftovers as heat will destroy major bacteria. 4. Never use stuff after the Expiration date - those dates have been printed for a good cause; don't give in to the urge of saving a few bucks by consuming expired food as it could cost you your health. 5. Avoid raw food like uncooked sprouts, poultry or eggs. Thoroughly wash all your salad greens too before using them as spinach and similar leafy vegetables can contain contaminants. 6. Use different utensils (knives, cutting board, vessels, etc) for meats and produce, or wash them thoroughly between use. 7. Try cooking at home as much as possible, and avoid any restaurants and eateries that you may think do not follow the cleaning guidelines correctly. In fact, report such places so some action can be taken against them. Insist on eating hot/warm food even at restaurants, to minimize chances of infection. These are just a few tips to help you make sure you are doing your best in preventing food poisoning. WebMD has a good read on Myths About Food Poisoning, in case you are interested in some additional tips. Remember, Health is Wealth, and though this may not seem like a disease or ailment you'd be too worried about, let me tell you that it can get really ugly when someone in your family bundles up with acute pain, fever and keeps throwing up every now and then. So do your best to prevent the spread of food-borne diseases, and keep yourself and your family healthy. As we try to focus on a healthy lifestyle, I would also like to bring to your attention the importance of eating fresh food vs packaged or pre-cooked food. Recently, I came across Phytolife, a great online resource for healthy lifestyle and cooking-related information, which I'd recommend you check out. There are so many minor changes that one can make to keep yourself healthy; let's take a moment to sit back, reflect and realign the way we feed our bodies, so we can prevent unhealthy scenarios way before they can translate into something horrific! Thanks for the great tips. I hope your family is feeling better soon. So sorry about that. My son get that sometimes from school cafeteria!! I'm sorry to hear your story on food poisoning. My husband suffered a few months ago from a take-away kebab & had to be injected stop the vomitting, so no more kebabs! I know you don't expect it from home, but it happens! and very difficult to trace the culprit. My friend also fell ill from semi skimmed milk, took ages to find out though. I was astonished to discover that there are a zillion more germs on a dishcloth than the toilet seat!! Great tips for a healthy life-style..we often dont check the expiration date on packets but we should be doing it always.. I hope your family recovers soon ..
thanks for sharing this info. We need to be reminded over and over again. Hope your family is feeling better now.. Thanks for the useful information..
That's a very informative and useful post, Mansi. Thanks for sharing it. Very interesting. But I think part of the reason we get food poisoning in the first place is because we are living in sterile chemical environments with little opportunity to build immunity to bugs and stuff. In my 18 years growing up in Calcutta I ate food mainly in dubious establishments off the road and never fell ill. Anyway, hope you all recover and my best for 2009. When food is not prepared and handled properly, that may be the cause of food poisoning. Food hygiene training and safety are actually available in some businesses to avoid such instances and to protect those who are going to consume the food that they sell or serve.